Big Macs are delicious. We can all be food snobs and pretend like they aren't, but the fact is, big macs were developed by scientists for optimal deliciousness. If you don't believe me, I bet you haven't had one in a while, and I REALLY bet you haven't had one drunk in a while. That being said, I'm not selling out to fast food or saying you should all be eating more big macs, I'm just stating facts. 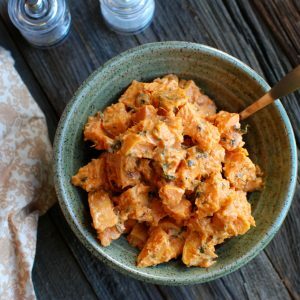 This recipe came to me a few weeks after thanksgiving last year when I was (surprise!) eating a big mac (and probably drunk?) I was thinking about what makes the burger good. Its OF COURSE NOT the burger itself. It has more to do with the interplay of the cheap bread, cheese, pickles, and crunchy lettuce. 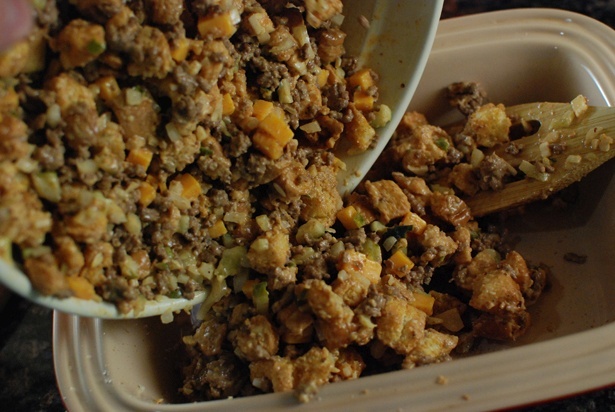 For some reason it came to me that the ratios of meat to bread to flavorings are similar to that of stuffing, and I thought it would be fun to literally buy 8 big macs, chop them up, stir in some chicken stock, and bake it off as a stuffing. Well I sobered up, realized I didn't want to spend 40 bucks at McDonalds, and had almost a whole year to develop this recipe. 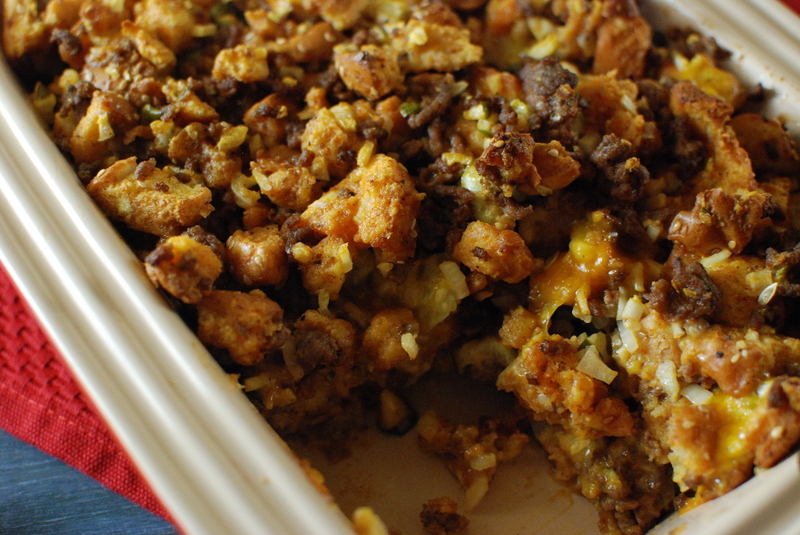 This stuffing came out absolutely amazing. When you eat it there is no question that you are eating a stuffing, and also no question that it is big mac flavored. 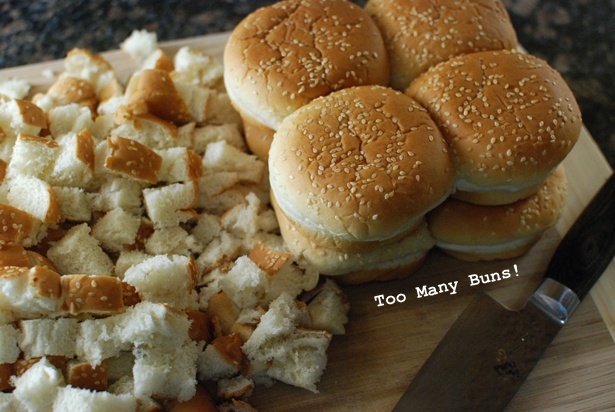 I bought extra buns because I wasn't sure how many I would need. 8 is the answer. 1 pack. 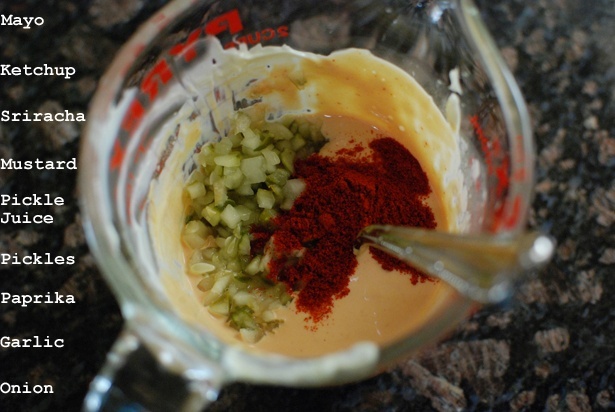 First make a delicious homemade thousand island dressing/secret sauce. Then you add a little chicken stock and an egg to this. The buns have been toasted and the meat has been browned in butter. Pour on the sauce! Pickle and onion. Then the cheese! You don't need much, it still tastes really cheesy. In other news, why don't we put cheese in stuffing more often? Pour it into a baking dish. This goes into a 325 oven for a half hour. 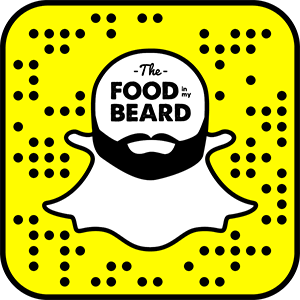 When it comes out its crisp, creamy, cheesy, bready, and just completely amazing. In case you didn't notice, it's also over the top fatty, so eat with caution! If you have this as a side with your dinner it will be fine, just don't eat it as your whole meal like I did! Wait aren't we forgetting something? Oh yea, that lettuce! The lettuce is very important to make it really taste like a big mac. If someone actually stuffs a bird with this, it will totally make my holiday season! 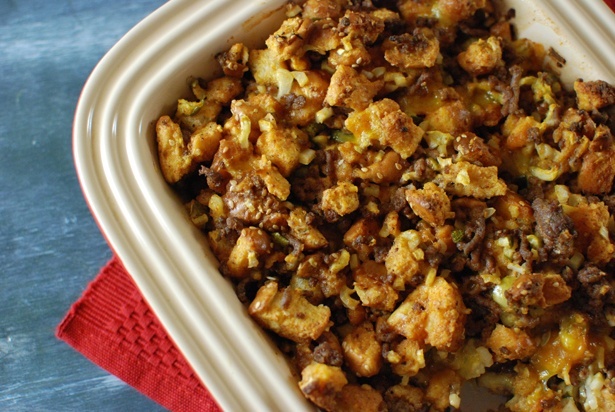 Chop up the bread into small cubes and lay on large sheet pan. Bake at 325 for about 45 minutes stirring occasionally, to lightly brown and dry out. 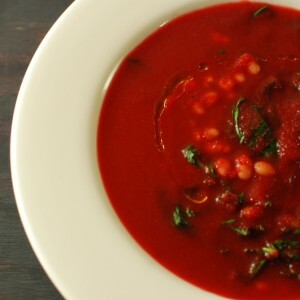 Mix all of the sauce ingredients and whisk vigorously with a fork. Be sure to take note of how amazing it tastes (possibly before adding the egg and stock). Dice up the onion and pickles and cube the cheddar. 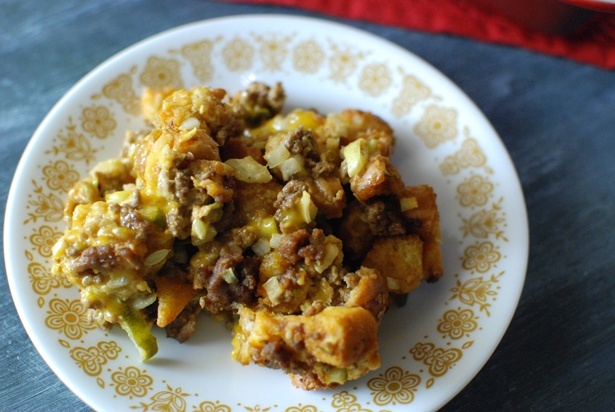 Melt the butter in a frying pan and add in the beef with ample salt and pepper. Stir the beef to brown and fully cook. Remove from heat. 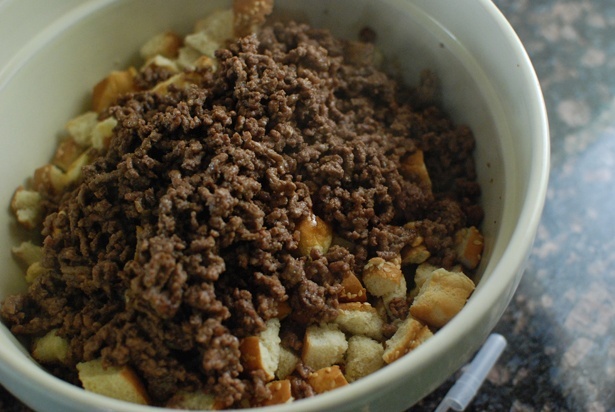 In a large bowl, mix the bread with the beef/butter mixture. Stir in the onion and pickle, followed by the secret sauce. Stir well. Pour into a baking dish. Bake at 325 for 30 minutes. 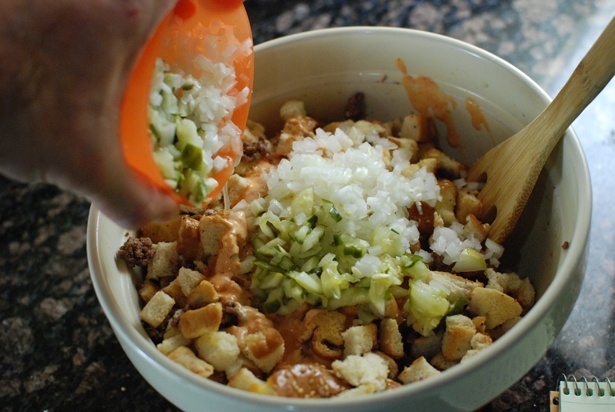 While its in the oven, shred the lettuce very finely. Top with the lettuce before serving. This. Looks. Freaking. A. Mazing. Sprinkling some more Sesame seeds on to before our the oven (or just after, or during) might make it look pretty and taste even better. 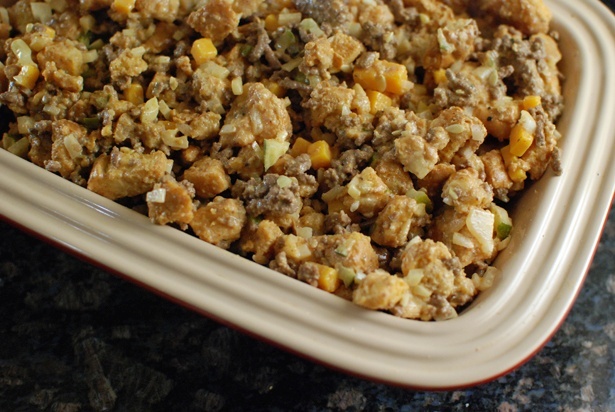 I don’t trust anyone who says they dont like McDonalds… anyone who says big macs aren’t delicious is also a god damnned liar (unless you’re a vegetarian in that case whatever) make this for thanksgiving please. 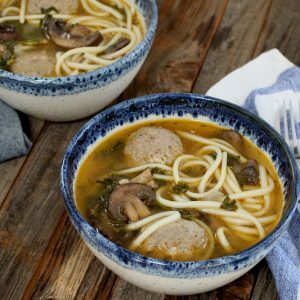 Love this idea… I kind of want to try it with pasta instead of bread — though I do love good cheap burger buns! This is so cool. You rock Dan! Some of my strongest childhood food memories revolve around McDonalds. Once in a while I will I say “this tastes like a Big Mac” when something is delicious and has just the right blend of flavors…my wife tends to get grossed out at that point. But I really like your idea. 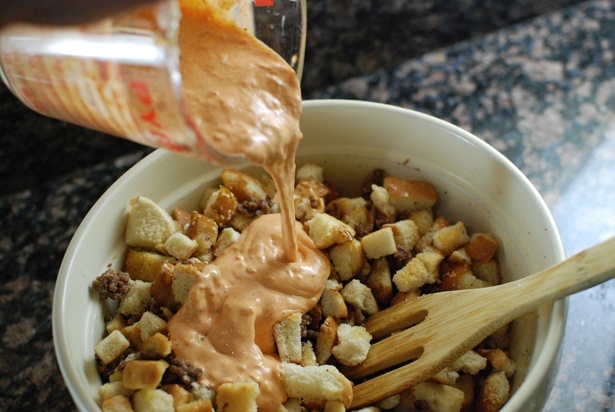 I think a Big Mac salad could also be awesome, with the sauce turned into dressing, the buns turned into croutons, etc. Maybe then the ratio of vegetables would be higher and it would be a little less of a gut bomb… Keep up the awesome cooking! I had a Big Mac flatbread at a restaurant in the Bay Area, and it was spot on. You are going to need to elaborate. This is like something they would do on Epic Meal Time, only reasonable. I love it. 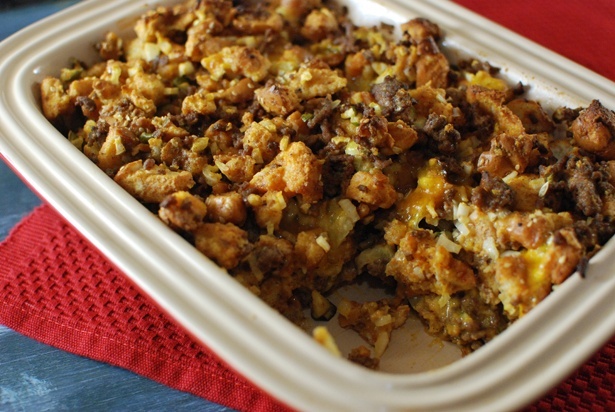 Sorry to bother you in vacation… I’m about to make this… could this stuffing go inside the turkey as stuffing or is it just casserole “stuffing”? OK my bad I just read the comment on the last picture… It’s my first turkey and I’m shoving a big mac up its “tail”… i’ll let you know how it turns out to see if it makes your holidays. 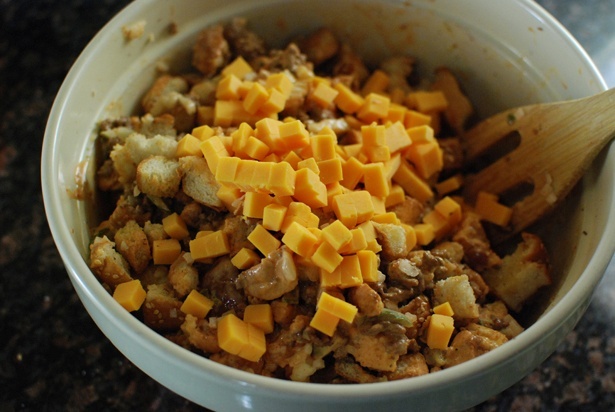 Just a note: the step-by-step recipe at the end of the post doesn’t explicitly mention when to add the cheese — you might want to give it a mention. 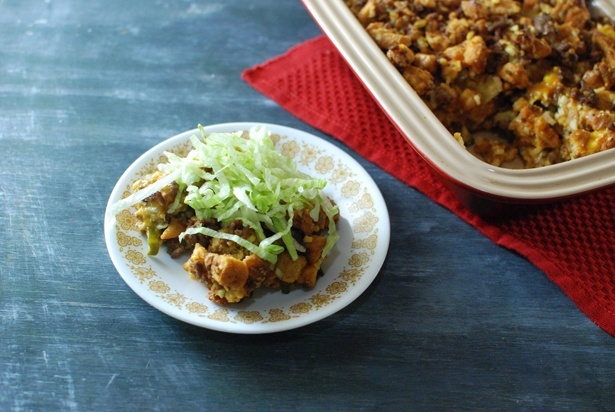 I plan to dethrone my sister’s Thanksgiving stuffing with this recipe… You my friend are a food marvel!